Ages 5 through 10. 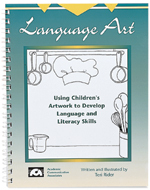 Use children's artwork to develop language and/or learning skills with the reproducible picture worksheets in this book. Storytelling activities are included in which children add their own artwork to picture frames and become actual characters in the stories. Reproducible worksheets are included. Picture Stories. Students are presented with a story theme and a series of incomplete drawings that relate to the topic. Their task is to complete these drawings and to tell a story about what they have drawn. Drawing Activities. Worksheets in this section include three unrelated sentences. Students are asked to draw a picture of each sentence. Students then cut and paste these pictures into a reproducible picture frame. Draw Me Pictures. Each of the worksheets in this section consists of a blank box and a descriptive story starter. Students are asked to draw a picture related to the story starter and to finish the story. Write Me Stories. Students are presented with drawings in four categories and asked to create stories about them. In the first category, students create stories for silly pictures. In the second category, students use adverbs to describe story action. Pictures in the third category develop skill in adding details to descriptive responses. In the forth category, students are challenged to provide solutions for problems depicted in the pictures. The activities can be presented by speech-language pathologists, special education teachers, and others who work with students who have language-based learning difficulties.